Our Net Promoter Score* based surveys consist of 2 steps. The first one is the voting scale from 0 to 10 allowing your customer to rate the likelyhood of recommending your service or product to a friend or colleague. This step is usually sent to your customer's by email or presented in the form of a website widget. And because this is easily done with just 1 click, our response rates are noticeably higher than those of ordinary survey forms. Afterwards the recipient is presented with a page containing a freely definable followup question allowing to comment on his or her rating. By using tags and an additional (multiple) choice question his or her feedback can be further refined. In case the recipient also completes this optional second step, a thank you page will be displayed with a customizable text. Including a coupon code or some other kind of gratification can help in getting better response rates. 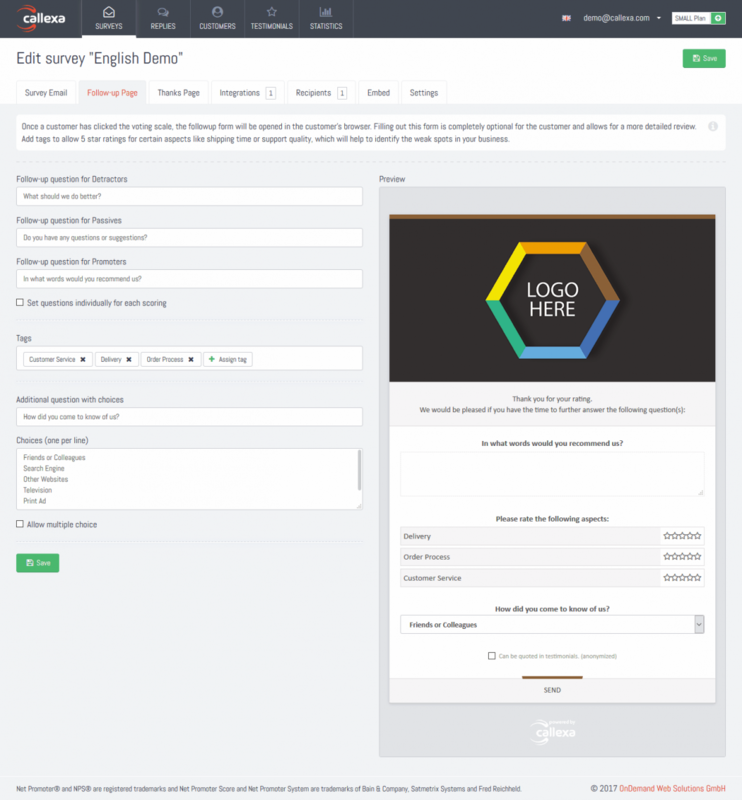 Although our survey templates are already filled with reasonable defaults and ready to be sent right a way, the guide below will help you with customization for getting better and more suited feedback. * Net Promoter, Net Promoter Score, and NPS are trademarks of Satmetrix Systems, Inc., Bain & Company, Inc., and Fred Reichheld. If not done yet register your free Callexa account here. All you need is a valid email address. When logging in for the first time you'll receive a notification „Welcome to Callexa Feedback“. Please fill in an internal name for this survey and choose the type of survey. With the type „Anonymous“ replies to this survey will be stored in no relation to the original recipient. This feature is recommended for employee attitude surveys. Note: The internal name is never visible to the survey's recipients. Since you can create more than 1 survey, use the name to differentiate between them. 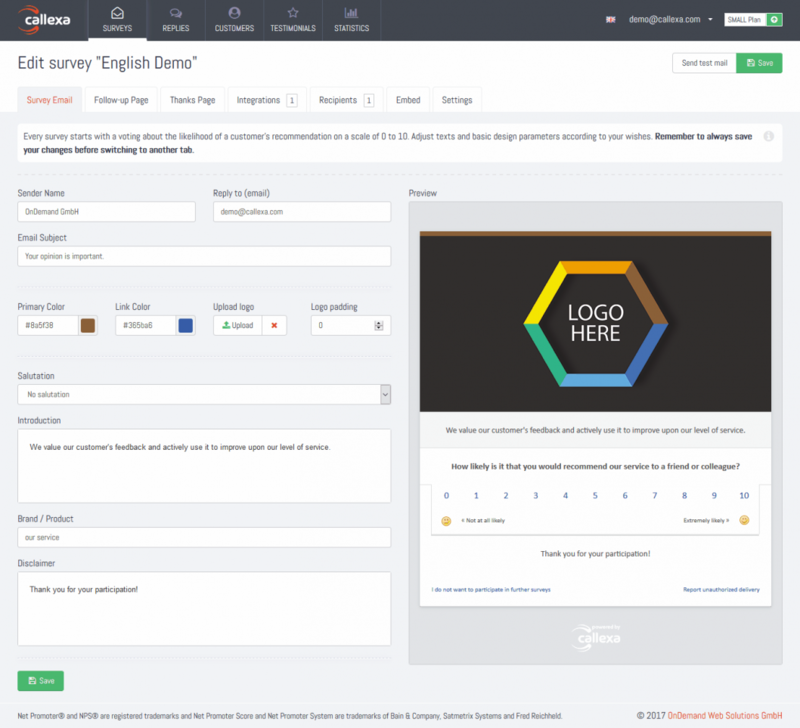 Now configure the details of your survey's first step (the voting scale). Sender Name / Reply to: These fields are only relevant if you want to survey your customers by email. Use your (company) name and a valid email address in case a customer accidently uses the reply function of his email client instead of clicking the voting scale. Email Subject: These are the first words your customers will see, so chose them wisely. Try to be neither too generic, nor too fancy. Otherwise the email might be considered as spam. Upload Logo: JPEG or PNG files up to 1MB are supported and will be automatically downsized to fit the template width (600px). We recommend using your brand logo or something similar. You should not include important text in the image, as some email clients do not display images unless the recipient requests it. Salutation: Set the grade of formality here. This setting is especially relevant if you import the full name of your recipients later on. If name or salutation are unknown Callexa always defaults to the matching generic salutation "Dear Sir or Madam", "Hello" or "Hi". Introduction: Keep it short but clear enough for your customer to know why he got this email, like a recent order or inquiry. Brand / Product: NPS* surveys use a proven and predefined questioning structure. This field adjusts the middle part of this question defining what the customer is supposed to "recommend". Disclaimer: Email footer. We suggest you add some legal information about your company here, which helps making the email appear legit. Always save your changes before switching to the next tab! When a customer casts his vote through the voting scale a new page opens posing one of 3 followup questions depending on his ratings. Promoters (9, 10) should be asked to describe why they are satisfied. Good comments can be used as testimonials later on, using our testimonial widget. Passives (7,8) usually have small critisism, so ask them what suggestions they might have. Detractors (0-6) need the most attention and are often eager to express their problems with your service or product. Another great way to get more detailed feedback is using tags. Adding a tag to your survey means the customers are asked to rate this aspect on a 5 star scale. Not few customer's are not willing to write comments, but still take the time to click some stars for giving a more fine grained rating what they were especially happy or unhappy about. We recommend adding no more than 5 tags which should be as short as possible, like e.g. "Shipping Time", "Customer Service" or "Product Quality". Last but not least a (multiple or single) choiche question can be added to the form. Customer's who filled the 2nd step form will be redirected to this thank you message, which is fully customizable. You can add information on ways to contact your customer service or even add a coupon code. If you mention a coupon in the introduction text (see step 3), it's much more likely for your customers to fill out the followup questions. Always save your changes before switching to another tab! Navigate to the "Settings" tab of your survey to see additional features available in your plan. Minimum Interval: This defaults to 26 weeks or twice a year and limits how often the same customer can be surveyed at most. For example if you're using a shop system and a customer places a new order just a few days after his last order. 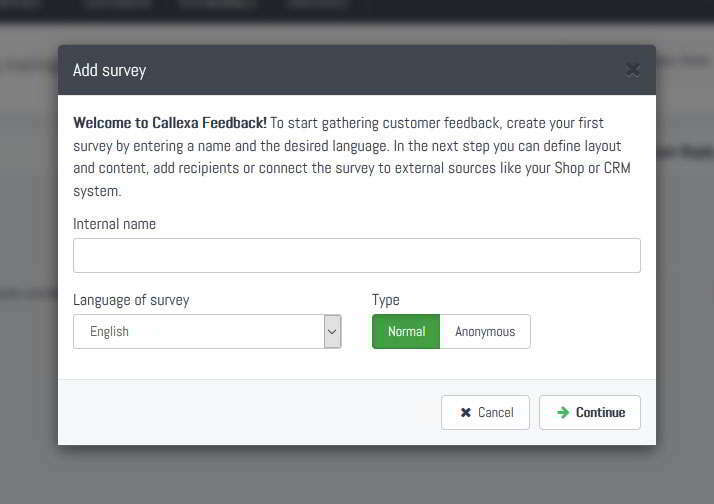 It can be a little annoying to be asked for feedback in such short intervals, so even if your integration or csv file submits this same customer again, Callexa will skip importing him or her again if the minimum interval has not been reached. Reminder Settings: Sending a reminder to recipients who did not cast their vote can help in getting more feedback but might also annoy the customer. So please use this feature wisely. It's especially useful for a well defined range of recipients, like staff members or dedicated subscribers. Anonymization: If enabled all ratings will be stored in no relation the original recipients, so you will not be able to determine which rate came from what recipient. Of course this also limits the range of statistical features but comes in handy in staff evaluation surveys or situations of high privacy requirements. 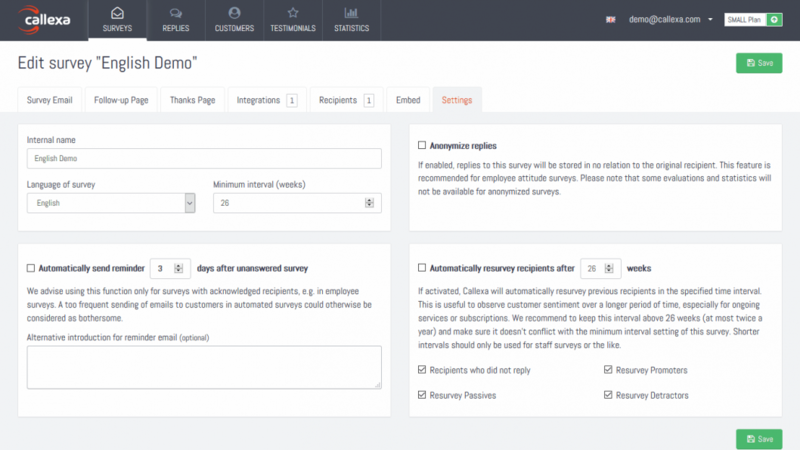 Automatic Resurveying: If you are manually adding recipients through CSV files or email addresses with no special relation to a certain event (like a placed order or solved ticket), you might want to resurvey those recipients with the given interval. Useful for subscribers or staff members. Keep the interval as high as possible or your constant surveys might be considered as spam or at least annoying.